Książka jest przypisana do serii/cyklu "Refuge". Edytuj książkę, aby zweryfikować serię/cykl. In the year 2025 a nuclear war breaks out in Central Europe, the Russians trying to secure their old empire. The dimensional gates open to another world, a world of magic, where our dreams of fantasy are real. The evil Emperor of the Ellala sees the millions of transplanted humans as soul energy to forward his scheme for immortality. He orders his armies to capture the newcomers, to place them in concentration camps where they can be harvested. But the Germans, French, Polish and other peoples or Earth have other ideas. 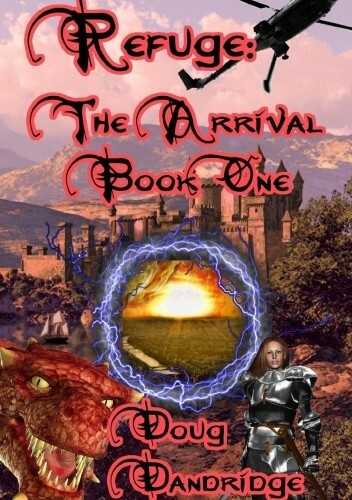 With the help of their American allies and the modern weapons of war they will fight back against the magic of the evil elves, while gathering their own allies in the fight for survival. For they are seen by the native peoples as the fulfillment of an ancient prophecy. And they have brought immortals with them to this world. men and women of great power on Earth, who become true demigods on the new world. So it is tank against mage, attack helicopter against dragon, and nuclear warheads against impregnable fortress, as the humans must use their technology while they still have it, and gain a foothold on a world beyond their understanding. Nieżły pomysł (po wybuchu III wojny światowej wybuchy atomówek powodują przeniesienie elementów kilku dywizji NATO i paruset tysięcy cywili do generic świata fantasy rządzonego przez złe Wysokie Elfy), ale niestety wykonanie miejscami kuleje. Takie czytadło, ale więcej jak te 3 dolary raczej bym nie dał.